Osteoarthritis (OA), the most common form of arthritis, is a degenerative disease affecting the hands, knees, hips, feet and spine. It is caused by changes in cartilage, the soft tissue that cushions and protects bone, leading to pain and changes in the shape of the joint. In knee OA, as the cartilage wears away, the bone ends may begin to rub against each other, causing severe pain. Joint unloading is a proven therapy that has become more common as the need for alternatives to end-stage joint replacement becomes more evident. Moximed’s KineSpring System is a joint unloading device available in Europe that has demonstrated clinical success in younger or active patients. Moximed came to Halsin Partners to help launch the KineSpring System in several European countries, including Germany, Italy, the UK and Spain. 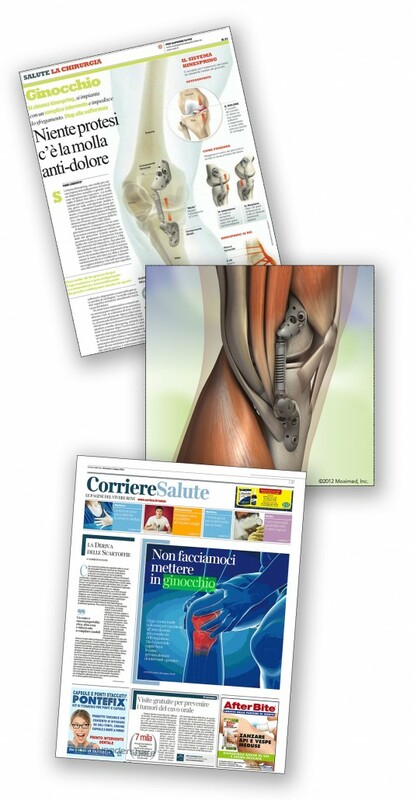 Across Europe, the aim of the program was to generate awareness and highlight the benefits of the KineSpring System amongst orthopedic surgeons and patients. As part of the campaign in Italy, the Halsin team organized a press roundtable during the European Knee Association (EKA) meeting in Florence. Three leading KOLs participated in the event to help explain how the KineSpring System benefits patients and fits into the OA treatment paradigm. The press conference was attended by 12 reporters, which resulted in coverage in several key national and local media outlets, including La Repubblica, ANSA, Quotidiano Sanità and Corriere della Sera. The outreach also prompted an invitation for one of the KOL’s to appear on the most popular Italian medical tv show – Medicina 33. Moximed and the participating KOL surgeon’s centers received more than 50 calls in the week following the publication of the articles from possible patients seeking more information about the KineSpring System.